It’s a mean feat to have your first collection featured at London Fashion Week. It’s even more impressive to have your designs worn by such sartorial heroes as Kate Nash. Top that off with completing a first class degree and running a blog and you’ve got Alice Jane Potter. Born and raised in North West England and completing her degree at Lancaster University’s close neighbour, UCLAN, Alice shows that you don’t have to be based in London to break into the fashion scene. 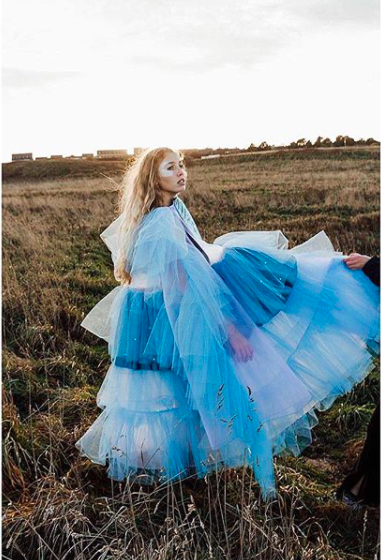 I caught up with Alice to chat about the inspiration behind her impressive inaugural collection, future plans and just how she managed to get Kate Nash to wear her designs. Hello! I’m a Fashion Design Graduate based in Blackpool in the North West of England. I’ve just received a First Class Honours Degree in Fashion Design at the University of Central Lancashire after four hard years of work! In my final year of my degree I designed and created my graduate collection “Cry Baby Club”, this collection was selected for the runway at Graduate Fashion Week in London and was in the top 100 of the 700 collections shown at the event. This opportunity gave me a massive boost as a designer and kick started my career in the professional fashion industry. Over the past year, your career as a designer has really taken off, with one of your designs being worn by Kate Nash. That’s an incredible achievement for a newcomer, how did it come about? I still have days when I can’t believe that it actually happened to me! When I was down at Graduate Fashion Week my collection was noticed on the catwalk by one of the judges Rebekah Roy. She posted my collection on her Instagram feed and story and she got in contact with me to see if I was interested in doing a shoot with Toni and Guy. I stayed in London an extra night and then went and worked with her and a team at the head office for a day. She made me feel so welcomed and taught me so much in just a few hours. She was so kind to me and mentioned that she styled Kate Nash and thought that my pieces would be perfect for her to wear; we kept in touch and I sent her over images of all of my looks from the collection for her to pass onto Kate. Around two weeks later I had an Instagram notification: “@katenash wants to send you a message”. I was in shock! Not only had she seen my work, but she had taken the time to personally contact me herself! She told me that she loved my work, which was a huge compliment. Rebekah got back in touch with me to say that Kate loved my stuff and was leaving for her tour at the end of the week and wanted to take one of my looks with her. I’ll never forget the shock, but the worst thing was that I had to keep my mouth shut as there was always a slight chance that she could have changed her mind! Not only did she choose to wear it on the tour but she wore it for a handful of the dates and social media completely blew up! I will never stop being grateful to Kate and Rebekah, it’s people like that in the industry who really give young designers a shot at some exposure and the experience was completely life changing for me. Are your garments inspired by other designers, or do you take your inspiration from elsewhere? My final year at University taught me a lot, especially about where to find my inspiration. I look a lot at the runway shows and what other designers are currently working with; I think it’s important to be aware of what is already out there. Each design season I select my favourite looks from the runway collections and do a blog post on them called “Fashion Week Favourites”. This definitely keeps me motivated and opens up my imagination to different ideas. You can take inspiration from an aspect of a designers’ work, but if you copy something people in the industry can notice it so easily. If you’re simply trying to complete your degree and not have a future as a creative then this works just fine, but I knew that I wanted my pieces to be recognised and they needed an edge to them. There aren’t an infinite amount of fabrics and colours, so you really have to create something that you’ve not seen before to get noticed. For me it’s not about a fabric, it’s about what you do with it. I laser cut, I embellish, I gather and manipulate my fabrics and these aspects turn a flat piece of fabric into something that hadn’t been seen before. It’s so much more memorable than a fabric straight off the roll. Alongside being a designer, you also run your own blog, alicejanepotter.com. Do you plan on continuing with both of these ventures in the future, or would you prefer to stick with one? Alice Jane Potter for me is my brand both as a designer and a blogger. I am extremely passionate about both of these aspects of my life and I will be continuing with both of them until the day that I no longer wish to. If I am authentically inspired and wish to continue with them then it will be my sole decision and completely my choice. Right now both of these things make me very happy and I can’t wait to see where I will be in a years time with my brand as I now have so much more time for myself and my ideas after finishing my degree. What would you say has been the most difficult part about designing and blogging so far? Finding time to juggle the two was definitely a struggle! I first started blogging when I was in my third year (year in industry) of my degree. I was working six or seven days a week but still had my evenings Monday to Friday to work on my content. My placement would never send me home with extra work, which allowed me some personal time to work on my blog. I think I was missing the feeling of creating something that was solely mine, so blogging definitely helped me work towards making something for myself. When I returned to University my blog had to take a bit of a back seat as my schedule completely flipped. I didn’t want to stop blogging and the great thing about it was that I didn’t have to – I just allowed myself a little break. I didn’t have the spare time or inspiration to put into content, so I didn’t really see the point in putting anything out there that if my heart wasn’t fully in it; it wasn’t fair to my audience. Fortunately, the final year of my degree definitely paid off and allowed me to create so much new content as a designer, which opened up my blog to a much bigger audience. As a Northern based blogger and designer, would you say your location makes it difficult to break into the fashion industry, given that so many opportunities are London-centric? In some ways it does limit me, I get quite a lot of offers for use of my pieces and the price of sending things off isn’t as simple as meeting someone in person with the garments. But I don’t think that London should be the only place for fashion in the UK, Manchester and the North is evolving and becoming a place that is known for so much creative talent which is fantastic. Blackpool itself has its own quirks but it’s home – I would love to be a known name and still remain in my hometown! Social media is an incredible tool that allows designers to do that and I think that’s so important in the world we are living in today. Who would you say are your biggest personal fashion inspirations? My fashion inspirations span across the whole industry. Haute Couture designers have my heart forever, from super feminine designers like Chanel, Elie Saab and Giambattista Valli to those who make extreme statements, like Alexander McQueen, Manish Arora and Comme Des Garcons. These designers are capable of doing so much with such incredible teams of people and make me fall more in love with fashion every single season. I also love small UK brands and everything they stand for; they give me so much hope that one day I could be doing something similar. The Glasgow based brand, Isolated Heroes, are a favourite of mine and I have been following them on social media since they started. Give them a follow on Instagram, they deserve it! And finally, what advice would you give to other young people who want to get started in fashion design? I will always tell people to only get into fashion if they feel completely invested in every single aspect of it. It takes a lot of time and a lot of expense if you do fashion as a degree then never touch it again. I you don’t have that real passion, then you will not have the belief in yourself or your ideas to succeed. You see all of the glamorous and professional Instagram shots all the time, it seems so normal, but it’s a really hard graft. You can spend four days making a sleeve just to burn it with an iron and have to start all over. There will be tears, happy and sad. I used to say that “Cry Baby Club” was an interpretation of how many tears I had cried over my final year but the tears were definitely worth it. You get out of it what you put in so if you throw your whole heart into it then the rewards are sure to come, no matter how big or small. Next articleWhat is it like to study abroad?